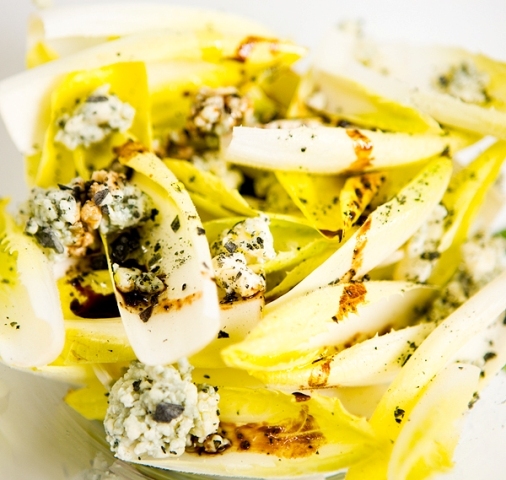 Crisp Belgian endive are lightly dressed with balsamic and finished with pungent Roquefort to make this Endive Salad with Roquefort. It is great as a simple salad course or even a light dinner. One of our favorite salads is the simplest to make, it is a Belgian endive salad. We love how the leaves gently cradle the Creme di Balsamico and pieces of ripe Roquefort, it is like a present with every bite. We love to pair this salad with a crusty and warm loaf of bread for a light dinner or with a roasted piece of meat for a bigger meal. Cut the end off of the endives and separate each of the leaves, put into a serving bowl. Crumble Roquefort over the top, to taste, we like a lot of it. Drizzle with some balsamic and olive oil, to taste. Sprinkle with Maldon salt and fresh cracked black pepper, to taste. 5 Responses to "Endive Salad with Roquefort"
looks sensational. love endive and roquefort - what an awesome combo! I love endives and serving things in the cups is just so elegant. These look like some great flavours here! Would look so good on any Holiday table. Love that you are adding Roquefort. I need to eat more salad and a combo like this might just get me to do it. Yum. Endive is one of my favorite winter vegetables. I like to chop the endive and add apples to a similar salad.